The growth prospects for Egypt’s paints and coatings market look promising in the short and medium term after the country steered itself out of the 2011 chaotic political revolution and managed to woo private sector investments in the real estate, industrial and general infrastructure segments. The promulgation of a new constitution and successful 2014 and 2015 presidential and parliamentary elections respectively has helped restore some degree of confidence in the country’s economy and the largest manufacturer and consumer of paints and coatings in North Africa. Despite the demand for paints and coatings having declined in 2011 and soon after because of what some analysts said was the estimated 7 percent decline in real estate investments to $4 billion, market experts say the industry is up and catching up fast. “Domestic demand for paints and coatings is expected to grow from $142 million in 2013 to $552 million in 2018 at the compound annual growth rate (CAGR) of 4.5 percent,” said Richard Weissenberg, business unit leader for chemicals, materials and food at Frost & Sullivan in an interview with Coatings World. He said Egypt’s growing population, now estimated at 93 million and growing at 2 million every year, and higher per capita income that is expected to be $2772 by the end of this year, are fuelling the expansion of the paints and coatings consuming sectors such as housing and other amenities. 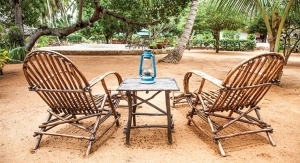 Some investors have already expressed interest in tapping into the increasing demand for housing. For example, in 2014 Egypt signed an agreement with United Arab Emirates-based contractor Arabtec to build one million homes across the country over a 10-year period at a cost of $40 billion. In addition, the government has approved a plan to build a new administrative city for Egypt over a seven-year period at a cost of $45 billion. The project will provide jobs to one million people and provide housing to at least five million others. These are examples of major projects that are expected to keep high the demand for paints and coatings in Egypt. 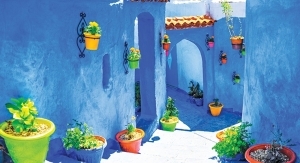 He said currently Egypt is the largest manufacture, consumer and exporter of decorative paints in North Africa. The decorative paints segment, Weissenberg said, has been influenced by the historical preferences of the Egyptians for things white and lighter. “Historically, the Egyptian paints industry has been favorable towards whites and lighter shades although in recent years there has been a swift towards bright,” said Weissenberg. There has also been a new trend in the Egyptian coatings market is the steady transition from alkyd paints towards emulsion paints. 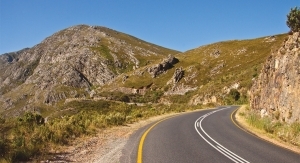 “Alkyd paints were preferred by the applicators until 1990 due to their perceived protective strength and durability but with the emergence of acrylic emulsions, alkyds are losing their presence gradually,” he said. 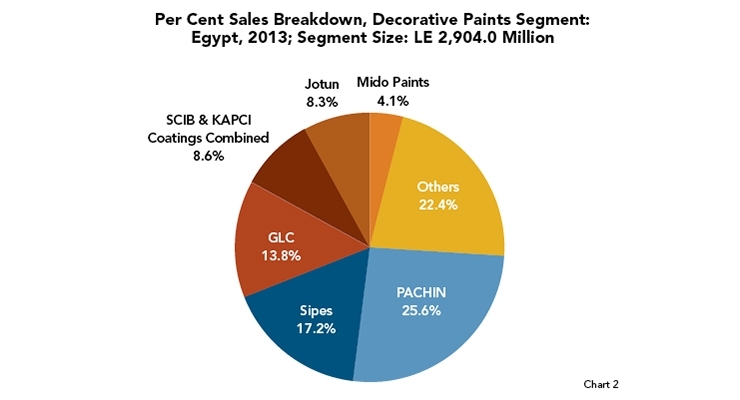 A review of the decorative paints markets show that the emulsion paints take up 51 percent of Egypt’s decorative paints market share while tinting and alkyd (synthetic) paints take up 18 percent and 31 percent respectively. A large share of raw materials for the making of paints and coatings, up to 55 percent according to some estimates, are imported mainly from Germany and South Korea although there is some local production for the materials such as linseed oil and solvents. The importation and utilization of these raw materials for the decorative paints is done by many companies in the market, which is currently dominated by PACHIN, Jotun, Sipes and KAPCI Coatings. These companies supply their paints through distribution network to institutional projects and to retailers. Products manufactured by these companies are supplied to distributors, who sometimes meet the demand by coloring centers and also project customers. 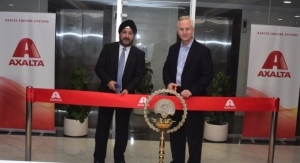 “These distributors are further connected to sub-wholesalers that supply the products in a given area,” said Weissenberg. However, the individual customers across the market are generally taken care of by retail stores or local paint shops. “These are multi-brand stores with small quantum of sale,” explained Weissenberg. Tinting/Coloring Centers is also a key segment in Egypt’s decorative paints market. The centers are exclusive outlets owned by franchisees of paint companies and which give customers opportunity to choose and create their own shades on site before they are formulated in-store using a tinting machine. 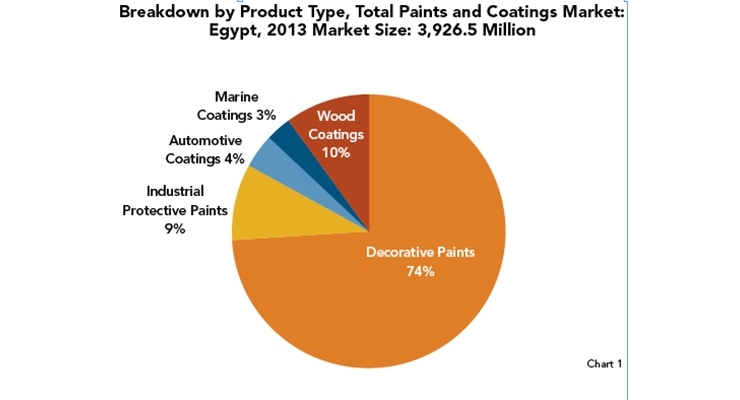 Although Egypt’s 2011 political turmoil is now history, the paints and coatings industry continue to face some challenges which have hampered the full exploitation of the country’s market potential. 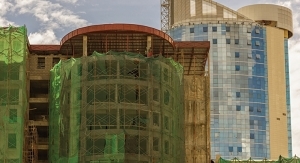 The World Bank says the Egyptian economy is still reeling from the low international (cash) reserves, a not-so-good investment climate, and the unfavorable external conditions such as the sluggish economic recovery in Europe and lower international oil prices which have eaten into the Egyptian remittances especially from the Gulf region. SCIB Paints regional head-Middle East and Egypt Manish Mehra said recently “the prospects in the medium term are not very attractive” for the paints and coatings industry in Egypt according to a report by MarcoPolis LLC, a Paris-based international online publishing company. “There has been a crisis in terms of availability of U.S. dollars to purchase raw materials and most of the raw materials are imported,” he said. It is estimated that up to 55 percent of raw materials needed by Egypt’s paints and coatings industry are imported. “All the companies have to import raw materials and in the last two years the availability of foreign currency has become an issue (leading) to pressure on the bottom line of all companies (and) that is why new investments which will be made by companies will be under pressure,” said Mehra. With the progress made on the political front and which has had a positive infectious effect on the economy, Egypt is likely to remain the top paints and coatings market in North Africa in the near future.